Beside the font attributes which can be set in the CD2DTextFormat MFC class constructor, DirectWrite supports more formatting for a block of text, e.g. text alignment, word wrapping, line spacing and so on. However, if taking a look at CD2DTextFormat documentation, we cannot find functions for doing that. Don’t worry, that’s not a problem at all: just call CD2DTextFormat::Get to obtain a pointer to contained IDWriteTextFormat interface, then directly call its methods like SetTextAlignment, SetWordWrapping, SetLineSpacing etc. // font family name, size, weight, style and stretch. // Further, let's apply more text block formatting! // Finally, construct a CD2DTextLayout object and draw the text in the render target. More details can be found in the attached demo application. This example shows only how to set text alignment and word wrapping. Of course, you can use any other format supported by IDWriteTextFormat interface. 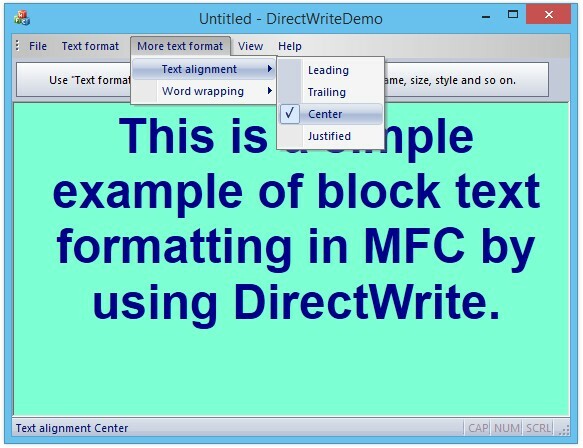 Some of Direct2D & DirectWrite features are supported in Windows 8.1 and later and/or may be missing in Windows SDK prior to v8.1, e.g DWRITE_WORD_WRAPPING_CHARACTER value for DWRITE_WORD_WRAPPING enum, which used as argument for IDWriteTextFormat::SetWordWrapping. See the DirectWrite documentation in MSDN. This entry was posted in Direct2D, DirectWrite, MFC and tagged Direct2D, DirectWrite, mfc on 2015.07.18 by Ovidiu Cucu.